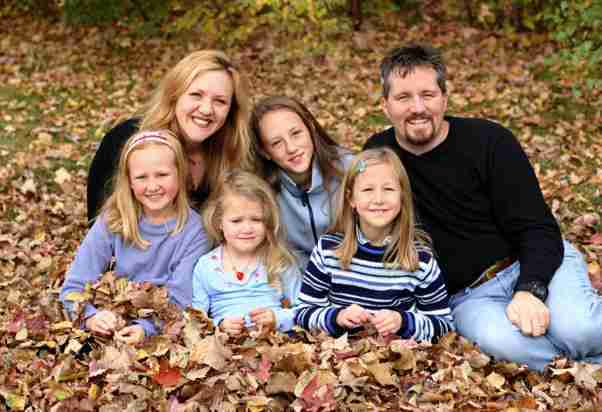 Family Portraits photos can be a lot better with some simple tips. We have a brief photography course for you below that we believe will help you take much better family portraits. Whether your family or someone elses family (Assuming you have permission!) Ok enough of the bad jokes. You can become a master at taking family portrait with lots of practice! Family portraits are about taking pictures that show the personality of the group if at all possible. Sometimes a stayed photo is needed but you can still have all the faces reflect their own personality. Go ahead . take a better family portrait. Have fun! Autumn is a wonderful time for photography not only for landscapes, but for weddings and family portraits as well. With the weather cooler and the light not as harsh it is far more comfortable for photography. Even with a good entry level DSLR camera and lens you can create some lovely family shots like this one. Instead of the photographer of the family missing out on being in the shot you can use a tiny wireless remote and have lots of fun doing your own family photos. 1. Make sure everyone's groomed ready and the clothing all matches together properly and the background in your shot doesn't clash. It really makes a huge difference to you photos when you spend time on preparation, and easier on the little ones who might not have your attention for too long in front of the camera. 2. Choose a neutral coloured background that is not too busy with objects that will distract from your subjects. In this photograph the autumn leaves make a lovely blanket of even colour. It is very important that the light is also even with no nasty shadows anywhere in the image. So its much better to place everyone in the shade or shoot with the sky being slightly overcast. But lets get the camera equipment set up first! 3. Attach your camera to the tripod .Choose a prime or zoom lens with the focal length anywhere between 35mm-50mm. A wide angle lens will not be suitable because you will capture too much unwanted background and it also may distort your image. A telephoto lens will have you too far away from the subject and you will not be able to get the slightly elevated look that this image has. 4. Have your camera set to a shutter speed of at 1/125th or 1/250th sec so that you don't motion blur from moving children with your aperture set around f8 for depth of field sharpness. You may have to increase the ISO a little to achieve this. 5. Once everyone is in place and you have left some room for yourself, and you are happy with the positioning check the elevated height that you need. By slightly elevating the height you might remove some unwanted background. Once your happy with your focus and framing then set your camera to remote in the self timer menu. 6. When you have joined the others hide the remote that's in your hand out of shot. Now your in charge of getting everyone to look at the camera and then fire the shutter via your remote when you are ready. 7. Remember keep everyone amused and don't take too long. With family photos small children need something to keep then busy (in this case the blanket of leaves) so you might need some small props that they could hold. And most of all keep everyone's heads reasonably close together it looks so much better with no waisted spaced areas.